These are weatherproof designs aimed at environments ranging from railway rolling-stock to cruise liners. 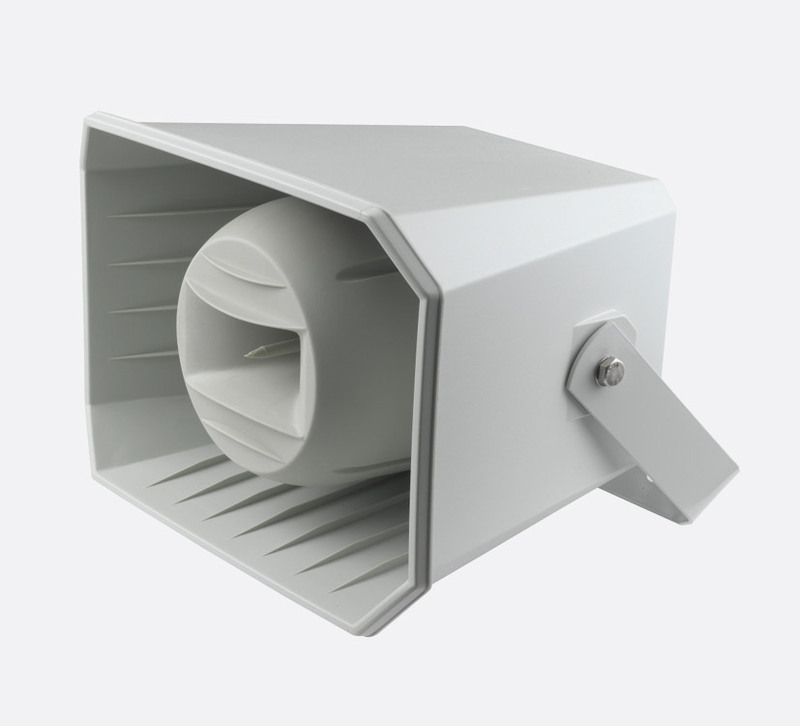 The DNH DSP-15L(T) is a 25 watt, high sensitivity, IP66/67, weatherproof, horn loudspeaker with a maximum sound pressure level of 122dB(A), suitable for installations such as industrial manufacturing plants, factories and on maritime vessels. With a frequency response of 290Hz to 11kHz and dispersion angle of 80 degrees at 1kHz, this lightweight loudspeaker features dual M20 gland entries and a large termination chamber for ease of installation. Cable termination is by screw terminals. A U shape bracket with three 7mm diameter fixing holes is provided. A multi-tap transformer is fitted to the line voltage models that allows adjustment of sound output. 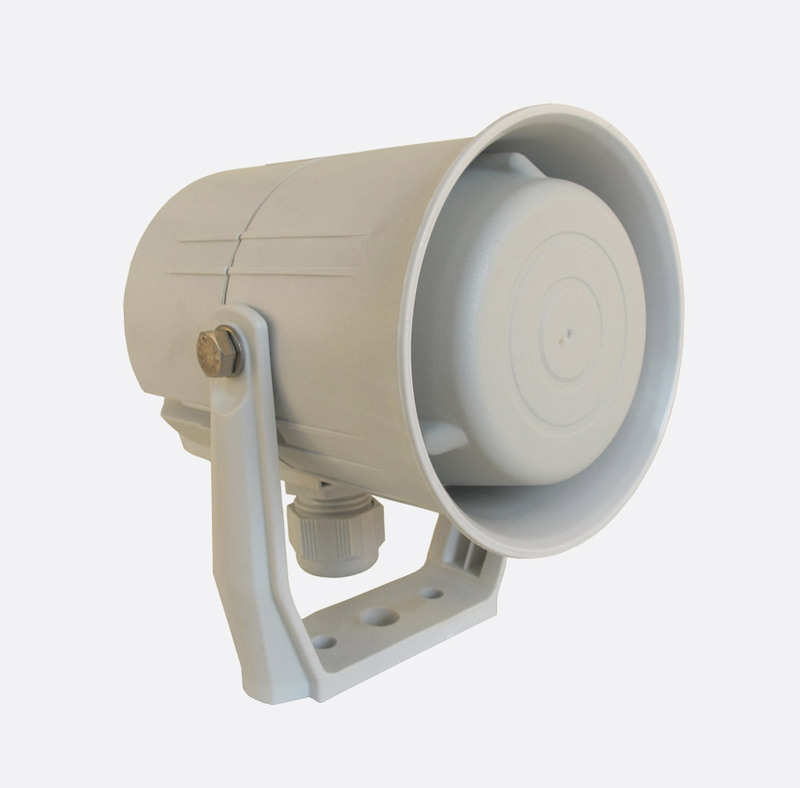 The DNH HP-6C(T) is a 6 watt, IP67 weatherproof miniature horn loudspeaker with a maximum sound pressure level of 107dB(A), suitable for installations such as talk back/intercom systems, maritime vessels and railway rolling stock. With a frequency response of 300Hz to 20kHz and dispersion angle of 178 degrees at 1kHz, this lightweight loudspeaker features dual M20 gland entries and a termination chamber for ease of installation. Cable termination is by screw terminals. A U shape bracket with three 7mm diameter fixing holes is provided. The HP-6C(T) is Bureau Veritas approved for marine installations. 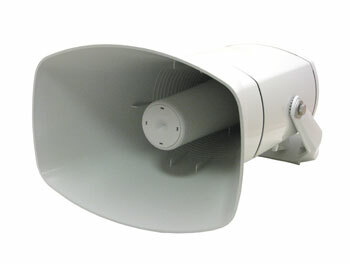 The DNH MH-50T is a 50 watt, IP55, weatherproof, music horn loudspeaker with a maximum sound pressure level of 121dB(A) suitable for installations such as cruise liners, sports stadiums and warehouses. The MH-50T has dual loudspeaker elements, one for low frequencies and the other for high frequencies that together produce excellent music and voice reproduction. With a frequency response of 140Hz to 16kHz and a dispersion angle of 65 degrees at 1kHz, this wide frequency range loudspeaker has a single M12 gland entry and a termination chamber. Cable termination is by screw terminals. A U shape bracket with three 10mm diameter fixing holes is provided. The MH-50T is Bureau Veritas approved for marine installations. Power: 25w rated, 25w max. 6w rated, 10w max. 50w rated, 70w max.